PALO ALTO, Calif., April 3, 2019 /PRNewswire/ -- Dr. Mandy Joye (University of Georgia), and her team recently discovered venting mineral towers that reach up to 23 meters in height. These towers featured volcanic flanges that create the illusion of looking at a mirror when observing the superheated (366ºC) fluids beneath them. The minerals across the features were laden with metals and the fluids were highly sulfidic, yet these sites were teeming with biodiversity and potentially novel fauna. "This is an amazing natural laboratory to document incredible organisms and better understand how they survive in extremely challenging environments," said Dr. Joye. "It is one of the most magnificent things I have ever seen in the natural world." 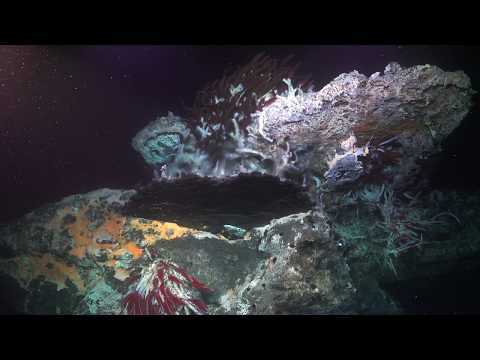 See and learn about the areas studied on the recent #MicrobialMysteries expedition in this video of highlights in 4K resolution. Researchers explain the beautiful, extreme, and thriving ecosystems that create "metabolic warriors," the forms of life that have the most to teach us in terms of survival and biomolecules. The expedition was an unprecedented study using advanced technology including 4K deep-sea underwater cameras and radiation tracking devices, as well as sediment and fluid samplers working via a remotely operated vehicle. To get a true measure of methane in the deep sea, scientists need to capture the samples at the source. The scientists were able to do this with a unique device that draws hydrothermal fluids into small capillary-like tubing. The common thread of the sample collections involved studies of methane cycling. Hydrothermal fluids and gas plume samples all contained elevated concentrations of methane, a potent atmospheric greenhouse gas. This study will advance the knowledge of the biological storage for methane in water column and sediment systems. As the different data sets are synthesized, scientists will generate a more complete understanding of the Gulf of California system. This understanding will be applicable to oceanic environments around the globe, as well as allow scientists to identify and frame exciting new questions. "It is a different world down there. Each dive feels like floating into a science fiction film," said SOI cofounder Wendy Schmidt. "The complex layers of data we've collected during this expedition will help tell the story of this remote place and bring it to public attention." You can view some of the amazing species discoveries in 4K here. Additional high resolution images and Broll can be found here. You can learn more at https://schmidtocean.org/cruise/linking-microbial-communities-environmental-drivers/.